Developed over 30 years ago in Japan, kinesiology tape flew under the radar of public awareness for many years, being used mainly in clinical settings. It wasn’t until the 2008 Beijing Olympics that it became an overnight sensation, when numerous athletes were spotted wearing colorful configurations of tape on various parts of their bodies. Future blog posts will discuss the mechanisms behind this therapeutic phenomenon in more detail, but for now we’ll look at what makes kinesiology tape different from other forms of athletic tape. Most types of athletic tape are non-elastic, and are wrapped tightly around an injured joint or muscle to provide support and restrict movement. It is used for short periods of time, after which it must be removed to restore movement and circulation. Kinesiology tape, on the other hand, is very thin and very stretchy, possessing virtually identical thickness and elasticity as human skin. This allows it to be manipulated in ways that no other therapeutic tape can, producing astounding benefits to the human body. Most applications can be worn for up to 5 days, allowing therapeutic benefits to accumulate 24/7. Wearers can sweat in it, swim in it, even bathe or shower in it … then simply pat it dry and go on with their activities! It’s flexibility allows maximum comfort, and the hypo-allergenic adhesive seldom causes skin irritation. 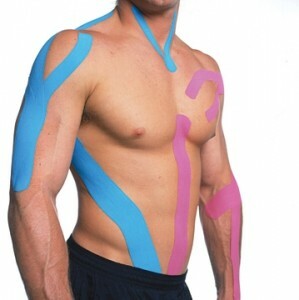 Watch for my next posting on the benefits of kinesiology tape … coming soon!